Why is a DMS System such an important decision? This buyer’s guide provides a dealer perspective on the factors important to selecting a DMS system that will match your needs and can improve your store’s performance. Use this guide, in conjunction with product and user reviews on the www.Drivingsales.com Vendor Ratings website, to structure a high quality, objective, product evaluation process that cuts through the noise to create a short list of potential DMS partners. What is a DMS (Dealer Management System)? DMS Definition: A Dealer Management System (DMS) is a system that clearly measures, reports and controls the functions within a dealership yielding quantifiable, reliable and timely information of significant importance to the dealer and dealership management. In other words the DMS provides the technological nuts and bolts backbone of the dealership’s day-to-day transactional operation. The system sells vehicles, schedules and tracks service department activity, stocks parts and reports/stores all this information on a monthly basis. Throughout these processes the DMS collects data and in turn functions as the transactional data “hub” of the operation. As you read this guide, think of your DMS system as an airline’s hub airport (Chicago ORD). Regional airline affiliates fly thousands of passengers a day into the hub airports from all over the country allowing passengers to connect with larger mainline flights (regrouping the passenger) to their ultimate destination. DMS functions in a similar fashion conducting many sales and service transactions, storing the data, and allowing valuable operational insight to be gained through looking at the data as a whole or in new sub-categories. As this buyer’s guide will demonstrate, the collection and access to dealership data will play a pivotal role in ultimately what type of system is right for your dealership and what partner aligns most closely with your priorities. DMS products have come a long way from the days of green screen terminals and impact printers that were programed to only print specific documents. The days of proprietary hardware and terminals anchored to office desks are a thing of the past (for the most part), replaced by web-based systems that operate on tablets and allow access to information anywhere an Internet connection exists. The major DMS providers that demonstrated their systems for us offer at least some, if not all, of their DMS application on a cloud-based architecture that is delivered from remotely located data centers. These new browser based DMS products greatly reduce the complexity and dealership overhead required to implement and maintain the technology. Hardware failures and the resulting prolonged down periods have been greatly reduced through the use of redundant servers that partition data on multiple hard drives, allowing almost simultaneous switch over if a primary server has an issue. Software updates are delivered via the cloud and in most cases entire DMS customer bodies are running either the current release or only one version back, greatly improving system stability and support. These new breed DMS providers help drive productivity gains inside the dealership by allowing what was once a very rigid service/sales process to become fluid, and in many cases, bring the process to the customer instead of the other way around. An example of this functionality is the number of service check-in and scheduling tools available via mobile tablets allowing the service writer the ability to leave his/her terminal and conduct vehicle walk-around/service recommendations at the customer’s vehicle in a collaborative manner. The current DMS landscape is evolving rapidly. For many years the market has been controlled by two dominant players, Reynolds & Reynolds and CDK (formerly ADP Dealer Services) offering relatively monolithic solutions. The market is now evolving with the entrance of new providers focused on product flexibility customized to dealership sizes and operational capacities. Even the market leaders are now re-architecting their solutions to enable better configuration and modularity. Agile Core DMS Providers: These DMS providers tend to be newer entrants to the market and have served as a catalyst for change in the category by focusing on modern technology that leverages third party products to enhance their core offerings. These companies have a defined market space of small to mid-size dealerships and groups (1-13 rooftops), which in many instances, share the DMS provider’s view of process evolution and open data access. These products offer the dealership a magnified voice in product direction (some providers even host yearly user conferences) and focus on the core DMS product offerings, leaving the development of solutions such as CRM products, online service scheduling tools and inventory management solutions to best of breed third party companies. Integrated Platform Providers: These solutions are provided by both new entrants and legacy solution companies. Products from these providers focus on offering a core DMS product in addition to a suite of products that provide tightly integrated optional components that reduce the need for third party product offerings. In many cases a number of the offerings are purchased functionality (third party companies) that has been integrated into the overall solution. Unlike the agile DMS companies mentioned above whom, generally, share a common data philosophy, this group of providers differs on their approach to data sharing with external third party companies. All of the integrated platform providers offer certified integration methods for third party data access, but the way in which they execute their respective approaches varies greatly. With so much focus today on CRM systems, dealership websites, smartphone apps and customer marketing, one could rightfully ask why a DMS is such a big deal. As mentioned previously the DMS represents the functional backbone of your dealership operation and is the transactional data “hub” that all of the aforementioned products will connect with to augment customer records. Access to customer data and the third party solutions currently deployed at the dealership will play a role in selecting a DMS. Lastly, putting the data connectivity aspect of the DMS aside, DMS conversions are long, expensive and tedious processes. DMS conversions are difficult on employees and productivity is hampered during the system ramp-up due to training and learning curve. It is important to take the time up front evaluating the correct solution for your individual dealership’s needs to make sure it is a choice you are willing to live with for an extended period of time. What requirements does the dealership have for remote data access? Will the current third party programs and applications currently in use be used with the new DMS? Do I prefer a single provider integrated solution to handle all, or a smaller provider that may offer more flexibility? These questions will provide helpful guidance when analyzing the correct DMS solution for your dealership. How many rooftops make up the current operation; is expansion on the horizon? What is the geographical footprint of the organization - is it campus-centric or spread out across multiple sites? Is the dealership or group comprised of multiple OEM’s? Each with their own unique processes and integrations? The proper DMS will support your current needs and future growth plans. An incorrect selection can ultimately require a move to a completely different product. The good news about the selection process is that based on your dealership size and requirements, the right DMS tends to become self-evident. As discussed in the DMS product differences section, providers have created products and carved out market share based on target dealership customers. The DMS product landscape and the ideal solution tend to follow a linear progression beginning with single-point stores and progressing to complex enterprise groups. As a dealership moves along this progression different providers tend to move to the background as others become more prevalent. This in no way signifies that one product is less capable than the other, but rather is a result of the product simply being geared at a target dealership type. As a stores size and complexity increase, the DMS cost and complexity tend to move in the same direction. In addition, as the operation’s complexity increases the number of solutions available tends to become fewer. The following categories outline three dealership scenarios and provide insight into the DMS offerings best suited to support each type. As a single-point operation, the dealership is unlikely to outgrow the capabilities of the system and many of the newer web-based products offer sufficient functionality at a competitive price point. Investing in larger integrated platform systems may end up costing this type of dealership more money while providing less flexibility in the end. Many mid-size dealer groups operate with sophisticated multi-company accounting practices and have future growth plans that may simply make some of the smaller DMS offerings unsuitable for their needs. Understanding the detailed differences between the agile DMS providers and the integrated platform companies (both functionality and cost), ultimately will define what system is correct for the organization. The enterprise dealership operations ultimately have the fewest choices when it comes to DMS platforms as the complexity and scale of the operations typically dictate the use of an integrated platform provider. The majority of new DMS entrant’s business models have not been focused on large multi-OEM groups and the functionality to adequately support these operations is not present in the systems. A key consideration for these operations is open access to their data and the ability to cost effectively integrate third-party applications to the DMS. As the chart above illustrates the agile core providers tend to offer additional base functionality within the core package, focused on complementing the standard group of components. Items such as desking and payroll allow the core providers to offeradditional productivity tools that position the product in more of a turnkey fashion. These providers then focus on providing open data access to third party providers to augment functionality not provided by their offering. A meaningful level of product integration can be achieved across multiple vendors if those vendors invest the effort in data integration. The integrated solution providers seek competitive advantage through connectivity and commonality in user interface standards and analytics between the system’s modules. Unlike the agile core providers, the integrated platform providers seek to offer a suite of integrated modules to augment their systems without the need for third party providers. Data access, for a supplemental fee, is provided for dealers requiring integration to a third-party product, but in-house products are positioned as the preferred solution. While all of the integrated platform vendors subscribe to this vision, the reality experienced by dealers in the near term may not live up to the vendor’s marketing claims. Some vendors have built their suites through acquisition and it can take years to complete the integration of these acquired solutions into their platform. Dealers seeking integrated tools should always evaluate the true level of integration offered through tests of common workflows in their stores. The different product approaches help demonstrate why the self-selection model discussed above tends to occur. The depth of offerings required to operate large group/enterprise organizations increases the perceived value of a well-integrated product set and tilts the table toward the more integrated platforms. However, some large groups have found that the superior functionality they can obtain from independent “best of breed” solutions is a better solution for their group than accepting a better integrated, but functionally inferior, solution from a platform player. Once an appropriate product feature set is determined, it is important to decide upon which product delivery method is right for the operation. Most DMS systems today can be configured to run in a traditional client server setup with a dedicated server either on-site or co-located. Conversely, the preferred delivery model (in all industries, not just automotive) is to provide the system through a cloud-based architecture. This model utilizes redundant servers located in data centers that deliver the product via the Internet to PC’s or tablets without the need for a server on location at the dealership. Depending on the organization there can be an argument made for both models. Large enterprise organization with IT staffs and the need for centralized accounting, marketing and other services may prefer the client server model and the ability to manage the technology themselves. Additional client server based systems are not dependent on Internet connectivity to function. Web-delivered systems greatly reduce the hardware and IT requirements of the average dealership when installing a DMS, and in many cases, the DMS can run on multiple browser types and is hardware-platform independent. Web-based systems are Internet dependent as their servers are located in the cloud; it is recommended that a dealership have two independent Internet connections available in case one malfunctions. The vast majority of dealers implementing a new DMS today will find the cloud-based solutions a superior path that reduces total cost of ownership and support burdens. When contemplating DMS functionality and delivery methods, it is important to keep mobile capabilities top of mind. Many of today’s DMS platforms have been substantially re-developed to provide mobile first connectivity to many modules within the system. Many of the systems utilize the same HTML 5 architectures of todays CRM and web-based productivity tools available in multiple industries. Mobile not only provides key management with the ability to access store data from anywhere an internet connection is available, but in many cases delivers customer focused service and F&I tools that enhance the customer experience within the dealership. If a vendor does not offer strong mobile support today one needs to examine their overall ability to maintain and support their products. 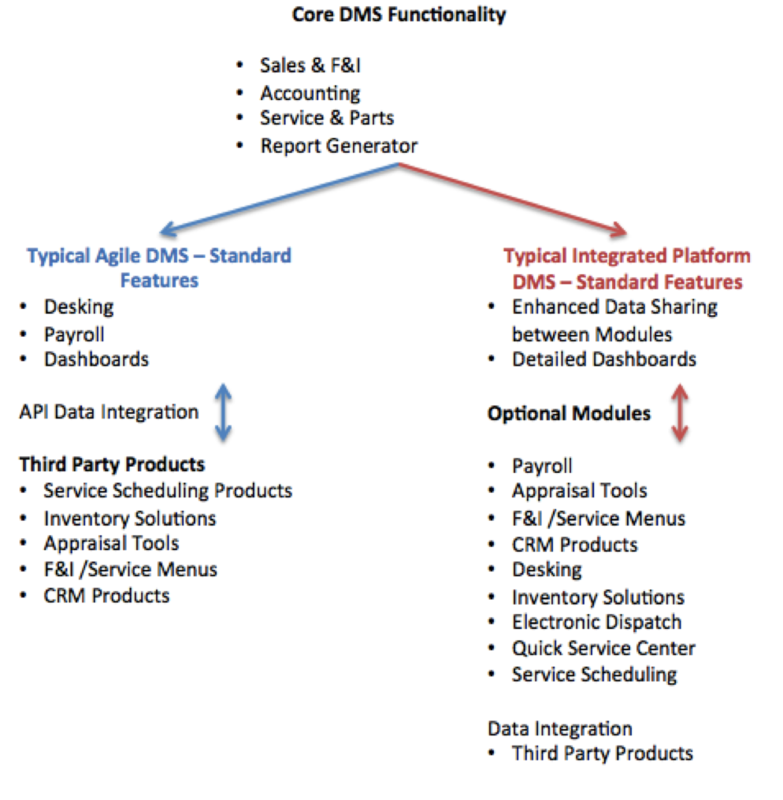 As the DMS product itself has evolved, so has the role of the DMS provider. Acquisition has been a common theme over the past few years in the automotive technology segment. Providers have purchased companies with products that provide synergies with their own platforms, or developed new ground-up applications to augment functionality. This trend has led to the creation of integrated platform solutions (as discussed earlier) that include CRM platforms, dealership websites, scheduling tools and much more. This change in philosophy has created DMS companies that are positioned as retail solution providers, which in many instances, can provide a solution to fill most dealership needs across departments. Depending on your point of view and DMS requirements, it could be debated whether a positive listed above is a negative and vise versa; what can’t be debated is the fact that the technology landscape within the auto industry is changing. On the surface the change in philosophies looks no different than many other industries that have gone through consolidation and restructuring. However when you look closer, there is a fundamental component of a DMS product that drives or supports in some capacity every additional product offering in the industry: data. The DMS is the data hub of the dealership (airline analogy from earlier) and captures every customer transaction performed. Retail customer transactions, such as vehicle purchases, service histories, household ownership data, credit data, etc. are tracked within the DMS. The list does not stop there; as wholesale business-to-business transactions are stored, such as parts purchases/returns, bank credit buying patterns, and warranty reimbursements from an OEM. The data captured inside the DMS is the lifeblood to making sound dealership decisions on a monthly basis. The data’s reach goes far beyond day-to-day store decisions and fundamentally provides the consumer intelligence that every third-party product provider in the auto industry requires to make its system function. Without DMS data, how does a CRM company know what a customer’s purchase lifecycle looks like? What does a service scheduling system integrate with to know available shop capacities and vehicle ownership status? How does a dealer’s website update sold vehicles on its inventory pages? The list is endless. DMS providers, for the most part, provide a certified bi-directional integration method to allow third-party companies access to customer data, but the underlying openness of these integrations is debatable. A large number of DMS providers do provide a reliable integration method either for free or at a small cost to the vendor. But the legacy DMS providers that have moved into the integrated platform space in the last few years have taken a predominately different approach to open data access. In many cases, the DMS providers (agile core providers) need the third-party companies to augment functionality that their product does not provide. By supplying cost effective integration solutions the DMS providers increase the marketability of their offering. In the case ofone large integrated platform company, which owns market leading optional products the need to restrict data, movement is not necessary (at the moment). Certain providers even go as far as to allow dealers the ability to setup automated data exchanges with third-party companies without the DMS provider’s involvement. For many years, access to dealer’s DMS data could be obtained from a variety of services with varying commitments to data security and the dealer’s control over that data. “Certified integration” came about as a way for DMS providers to allow secure data access while controlling the manner in which is accomplished. The major platform providers have created rigorous integration approval processes that third-party providers needed to complete to have access to the system and meet standards for data security. These processes generally have the result of shutting out low cost independent data integrators and requiring the dealer to pay for integrations as part of their application subscription fees. Data security is mandatory in today’s interconnected world. DMS systems contain financial and other information on your customers that are highly valued by criminals bent on identity theft and other frauds. Retailers who fail to properly secure their client’s data are taking unacceptable risks around financial liability and their reputation. Thiscertified integration processes proved to be a double win for the legacy providers in that charging for not only the integration process, but also monthly fees for every dealer rooftop created a sizable revenue stream. Secondly, and more importantly, it allows the legacy provider the ability to control the pace at which a provider is certified (the second win). The dollars associated to monthly-certified third-party product charges from Reynolds and CDK can be as high as 25-30% of the subscription cost. The legacy providers stipulate that the fee cannot be broken out on a dealer bill and as a result appears as part of the third-party product cost as a whole. Other DMS providers currently have much lower data integration fees. In one of the few instances where these fees have been publicly disclosed, a CRM provider offering a $1000 per month solution charges a DMS data integration supplement ranging from $0 to $600 per month based upon the brand of the dealer’s installed DMS. This difference in costs across DMS platforms can easily amount to $1000-2000 per month in supplemental fees across the set of applications commonly used by dealers. When selecting the appropriate DMS for your dealership it is important to understand the complete cost and product landscape. In many instances a legacy provider will still be the correct choice in that the functionality offered and optional components provide the best solution for the dealership. But for other installations, an incorrect choice may lead to higher costs and in some instances replacing the DMS with an alternate product. The DMS is a comprehensive piece of technology and depending on the available options selected during the purchase process, the installation process will touch every department within the dealership on multiple levels. The installation process needs to be considered and a rough plan needs to be outlined by the dealership before the calls to schedule system demos even begin. This is extremely true if you are transitioning from one provider to another. Reach out to trusted fellow dealers for their experiences and research installation online to learn what you can expect. Once you engage providers, understand upfront their process for installation and conversion and make sure you agree and understand the process. Will you need to extend the current contract to work with the new providers timeline? Use potential backlog time wisely and ensure that your dealership team is ready and organized for the transition. Schedule the Installation: DMS providers offer the ability to schedule the installation of your system to help elevate backlogs and better coordinate resources. Utilize this option and work with your provider and key dealership department resources to coordinate your installation. If you are transitioning from one DMS to another, ensure that you coordinate your existing providers support as well. Converting a DMS requires the coordination of two companies not just one. Expect a learning curve: DMS companies all provide online training and in some cases off-site (at the DMS providers’ offices) prior to launch of the system. Take full advantage of this offering and ensure employees have time in their days to focus on learning (if at all possible, have the DMS provider load your data before training to make the learning process easier). Productivity will suffer during the conversion, as employees will be conducting business on the old DMS, learning the new and trying to satisfy customers on a daily basis. Plan for this learning curve up-front as part of your installation and encourage employees throughout the process. Utilize the DMS providers on-site help: When the system launches, DMS providers bring a team to the dealership to help departmental mangers and employees with hands-on operation of the system. System providers will always stay on-site for the first month’s end close and many will be on-site for the second month’s end close. Take advantage of these resources and fine tune the system throughout this period. When the DMS on-site staff leaves, it is important to have the system performing in the manner expected. Retrieve all data from the old DMS: If transitioning from one provider to another, ensure that all of your data has been moved to the new system. The previous DMS provider in many instances will charge a fee to retrieve additional data once the conversion has officially closed. Installation is a tedious process and proper planning up-front will help facilitate a successful installation. The complex nature of a DMS tends to lend itself to contracts that vary in term and structure by provider. The agile core providers outlined in this guide will often offer contracts as short as twelve months and pricing concessions for longer agreements. The integrated platform providers’ contracts (largely the legacy providers) operate with contacts that are typically in the 3-5 year range with some contacts extending further. Price and contract length are intrinsically tied in these contacts and the longer the contract length the more aggressively priced the system will become. The overall cost of a DMS is largely a unique negotiation with each individual installation. Each provider has stated retail prices for the products, but depending on options selected and the length of the contract, each installation can become a unique pricing equation. In evaluating the true cost of a DMS solution it is essential that a dealer not only get a price quote from the DMS providers themselves but also from the set of independent applications they anticipate using with each platform. A DMS is an investment in how the dealership will operate and function for many years to come. Take the time to adequately research each system and come to the correct selection for your dealership needs. Ensure the system is positioned to grow over the years and successfully continues to meet the changing demands of the market. Most importantly, ensure your voice is heard from start to finish. Finding a partner that understands and listens to your needs/concerns will make the system that much more valuable.